It couldn't be easier to donate to the Friends of the 502 Group. 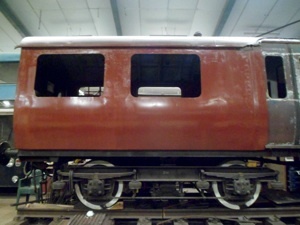 Use the options on this page to make a simple, one-off donation to the group and support the ongoing restoration of this unique electric train. All donations through this page are processed through PayPal for maximum security. You may donate using a credit or debit card. A PayPal account is not required — but having one will make the process even simpler! If you would like to become a member of the group rather than simply donating, please visit our membership page instead. Donate £283.61 or £298.96 and we will commemorate your generous gift with a brass plaque fitted to vehicle 28361 or 29896 as appropriate. Note that although we promise to fit the plaque, due to the ongoing restoration work we cannot guarantee exactly when this will happen. Want to give less than £283.61? No problem — just use the button to the right. You will enter your donation amount on the next page. If you have any queries about your donation, please contact the treasurer.